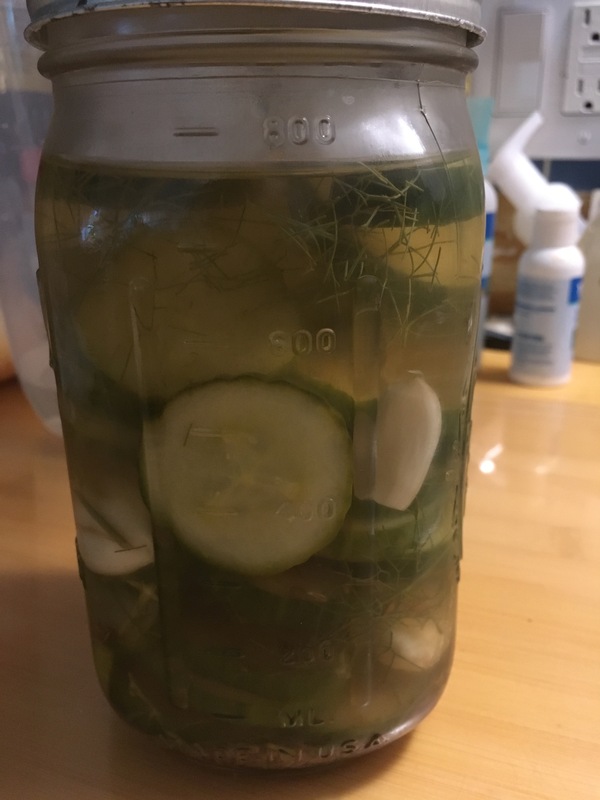 I’ve heard about refrigerator pickles for years. They pop up every so often in those “10 must have foods for summer picnics” sort of articles, and this summer I started to wonder if they were really as easy to make as those articles said. Then I got en email from my local grocery with what appeared to be a very simple recipe. I figured why not try. Wish I’d tried years ago! Yes, it is that easy. The hardest part, I think, is slicing the cucumbers. I let my mandoline do the work, though. I set it to about 1/4 inch and (using great care, of course) had at it! I followed the recipe exactly and ended up with a pickle that is a tiny bit more tart than I like. I think next time I’ll try adding maybe a tablespoon of sugar to the “brine”. And more fennel but more about that shortly. See, at the end of their recipe they make suggestions for spicing up your pickles. You may know, if you’ve been reading this blog for a while, that I love fennel (almost as much as the black swallowtail caterpillars do!). My yard has several nice stands and rather than harvesting the bulbs, I use the fronds. They’re dandy on salads, in smoothies, or just for munching. And, they are delicious chopped and added to cucumber pickles! Here’s the short version of what I did. Only thing is, do be careful about the cukes. Grocery cukes are often waxed and for pickles you don’t really want to peel them. I recommend either the “English” or seedless kind – the long skinny ones that come in plastic wrap, or going to your farmer’s market and buying fresh off the vine. Put everything but the cuke, fennel, and cumin in a stainless steel or glass pot, heat to boiling, remove from heat. 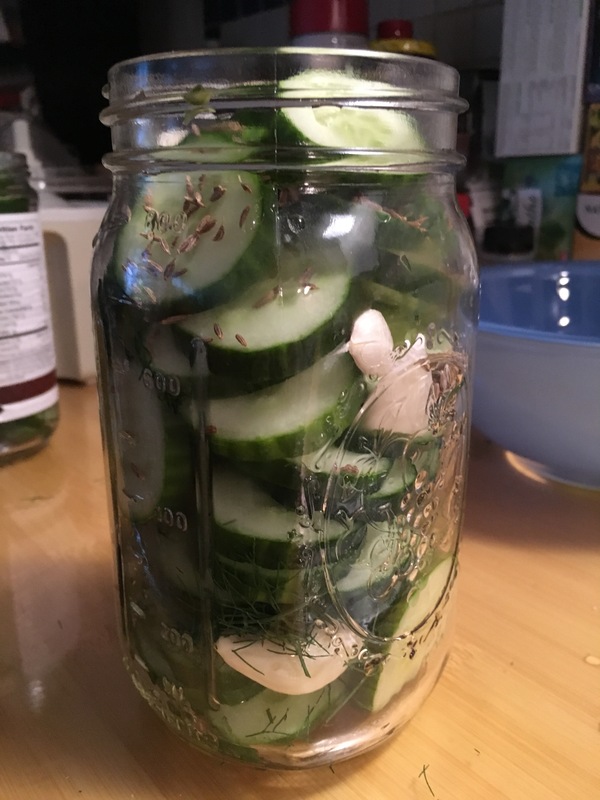 Cut the cucumber into roughly 1/4 inch rounds. Pack into a clean glass jar, interspersing the layers or cucumber with some fennel, some cumin, and the barely-boiled garlic. Pack tightly. Once that is done and the liquid has cooled for about 5 minutes, pour the liquid over the cucumbers et al to cover. Let cool to room temperature, cover tightly and store in fridge. In any event, I’m envisioning a long hot summer of pickling a variety of vegetables. And, of course, sun-drying something or other in the car but that’s another story! Stay hydrated and wear your sunscreen!! Good for you for trying pickles. If you like a little spice, my uncle used to always make spicy ones by adding some red pepper flakes. They were great on a sandwich or in potato salad.